If there was a time to have cataract surgery, now would be it. The days of stitches, discomforts and lengthy recovery are long gone! 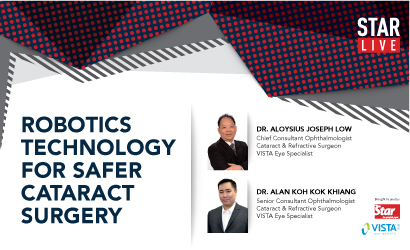 Replacing the use of a hand-held surgical blade with FDA-approved robotics no-blade femtosecond laser, today’s revolutionary cataract procedure minimises risks for safer, painless and quicker recovery. Join us for StarLIVE with VISTA Eye Specialist to discover how you can be spectacles-free after cataract surgery, and see the world clearly with renewed vision. All attendees will received a FREE goodie bag, so register now!